The developer of the sinking Millennium Tower on Tuesday blamed its recent troubles on the “reckless behavior” of the public agency that is constructing a $2 billion plus Transbay transit hub next door. 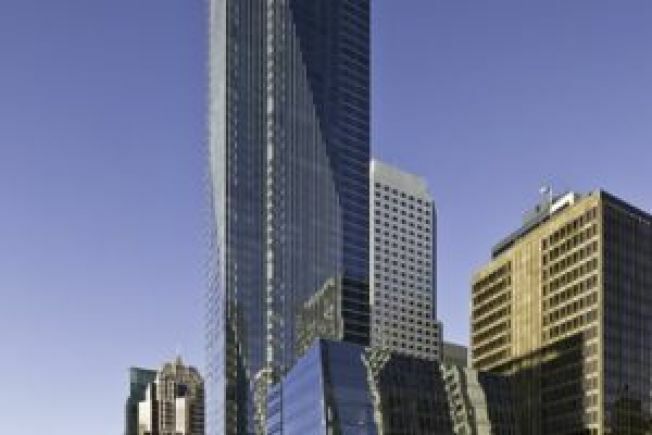 At a press conference Tuesday, Millennium’s founding partner, Chris Jeffries, said the Transbay agency’s work next door drained the soil around the 58-story tower at 301 Mission Street – home of such notables as Joe Montana and Hunter Pence. “Unfortunately…a pattern of reckless behavior” by state-sanctioned Transbay Joint Powers Authority, Jeffries said, “over the course of several years has caused the settlement issues” at the building. He said media reports aside, the building is safe. Still, the building has sunk 16 inches and one independent expert predicts it could sink nearly twice that amount. It also leans to the north and west, away from the Transbay transit terminal on the building’s south side. Since the sinking issue became public last month, the Transbay Joint Powers Authority agency building the terminal has blamed Millennium’s “defective” foundation for not anchoring its piles to bedrock 200 feet below the structure. He noted that while four buildings near the terminal go to bedrock, most others don’t. “We did this building the right way,” he stressed, adding that Millennium relied on top-notch engineers and design experts in the Bay Area. He pointed to a letter in which Mayor Ed Lee vouched that the Millennium project met city code requirements. Two experts, meanwhile, have studied the sinking and have declared the structure “100 percent safe,” Jeffries said. The reports will soon be turned over to the city, he added. While Jeffries acknowledged that while the building was originally thought to only six about a half a foot, he pointed out that Millennium notified the city back in 2009 that the first estimate was too low and the structure had sunk more than 8 inches and could sink up to 12.3 inches. Millennium blamed the draining of too much water from the soil around and under it, he said. “It was not considered a significant event,” Jeffries said of the company’s 2009 acknowledgement, although documents obtained by NBC Bay Area show that a city building inspection engineer did express “concern” to Millennium about the issue at the time. “The building was designed to settle far more than even the amount of settlement that occurred at that time,” Jeffries concluded. Still, he said, the problem did not end there, thanks to the Transbay project. During construction of a $58 million wall, contractors drained the ground water starting in 2011 under Millennium, by Millennium’s account. Jeffries said that the digging of a “massive hole” led to a drop in the water level by a “staggering 20 feet” as of last year, more than six times the cap the authority committed to on draining. While Transbay assured Millennium that its water removal did not begin until early 2013, Jeffries cited evidence he says indicates water removal began as early as 2011. “We were promised there would be zero impact on ground water,” Jeffries said. The water depletion, he said, turned out to be “unprecedented,” and continued until recently. He said the “reckless” conduct over several years “has caused the settlement issues “The behavior here is so outrageous to me,” Jeffries said. Transbay officials late Tuesday issued a statement responding to accusations from the Millenium partners. "There is no evidence to support Millennium Partners’ claim that the TJPA’s dewatering is the cause of the excessive vertical settlement and tilting of the Millennium Tower," TJPA said in a statement. "By the time the TJPA started dewatering adjacent to the Millennium Tower in May of 2013, the Tower had settled approximately 12.1 inches and was tilting further to the west/northwest. This excessive settlement and tilt is due exclusively to the deficient foundation system for the Tower. Other buildings adjacent to the TJPA’s excavation have not experienced similar settlement as a result of dewatering." Also on Tuesday, NBC Bay Area first reported that City Attorney Dennis Herrera issued a subpoena against the developer for documentation of what it disclosed to would-be purchasers of the building back in 2009. Millennium officials insisted Tuesday they would have been happy to simply give that information without a legal demand. At the moment, Jeffries said, the company’s “greatest concern is to talk about a fix – in order to fix and solve the problem, we need to have the information. We have not been able to get that information” from the authority. He did not outline what such a fix might be. Meanwhile, city Supervisor Aaron Peskin will preside over a hearing on Thursday on what the city knew and did after being alerted to the problem back in 2009.